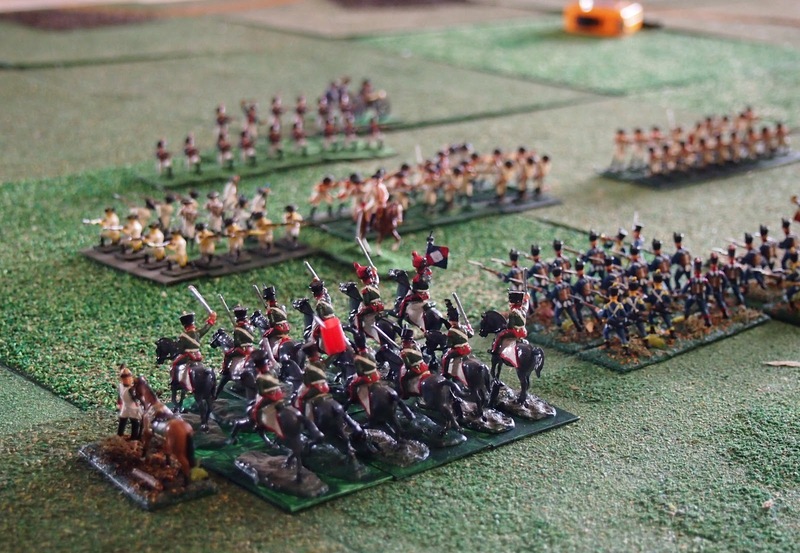 It’s not easy playing Spanish in Napoleonic wargaming, especially historical games based on the early years of the Peninsular War. 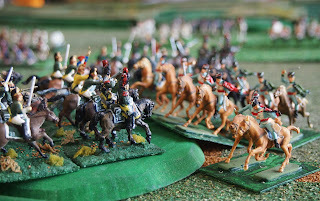 In most battles the Spanish army was hampered by poor command, questionable tactical deployment and large numbers of relatively fragile volunteer units. A victory for the Spanish would be a momentous outcome; generally the aim is to see how well they can perform. 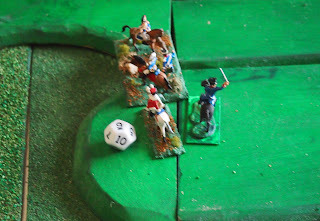 It was Mark who 'bravely' took the Spanish for our game based on the Battle of Medellin using the scenario from Chris Leach's Fields of Glory. 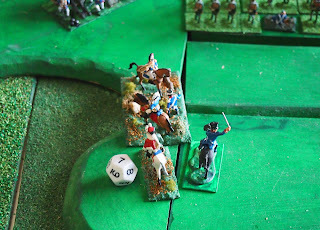 As you’ll see from the report below, he gave it a good go and, despite the inherent limitations, coupled with some crucial, terrible die rolls, he got close to an unlikely victory, before it all fell apart completely. Our table with large ridge at front right and smaller ridge (Latour-Maubourg's start position) at front left. 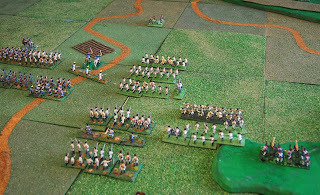 We have been most impressed with the scenarios in Fields of Glory which have been well designed to provide a challenge to both players and a well-balanced, enjoyable and close-fought game. 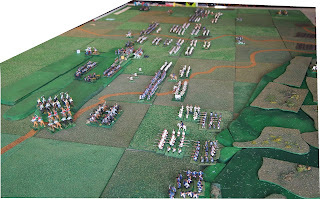 In all of the scenarios in the book, the basic set-up and orders of battle are historical, but the terrain has been simplified, with only the main features represented, with orders of battle and/or victory conditions adjusted to produce a balanced game. The scenario for Medellin is no exception. 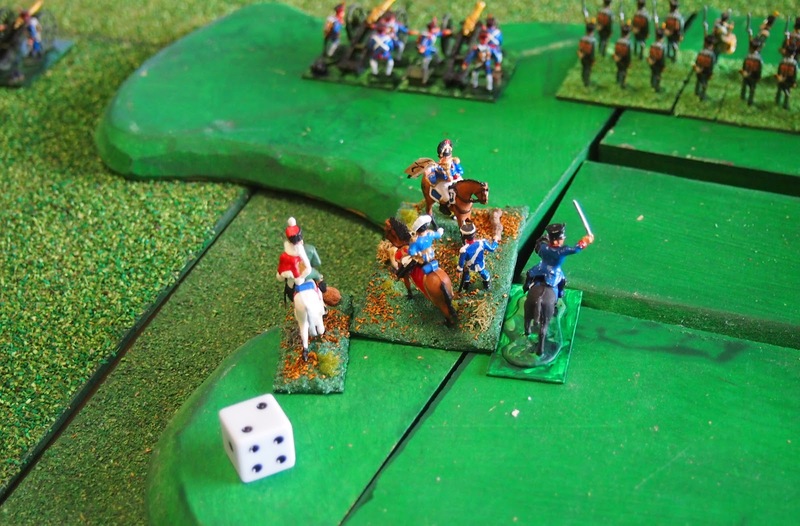 The Spanish army begins the game deployed in the C18th-style that Cuesta had adopted, viz. 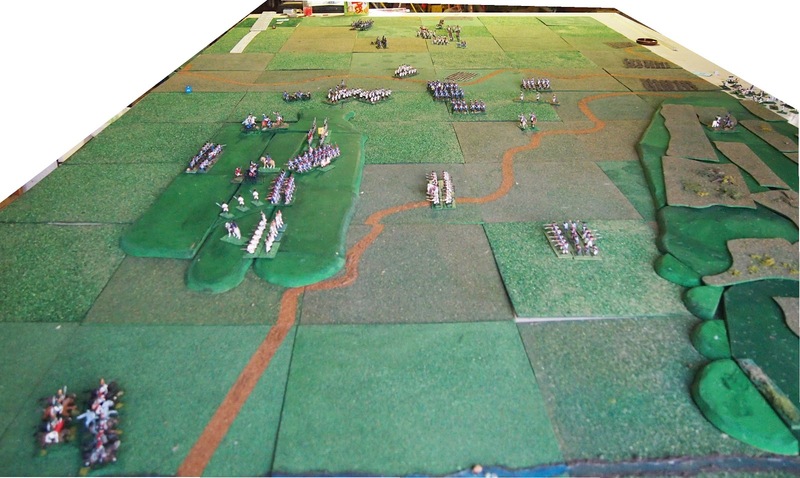 a long line of divisions with no support and no reserves (see map and photos of initial deployment). 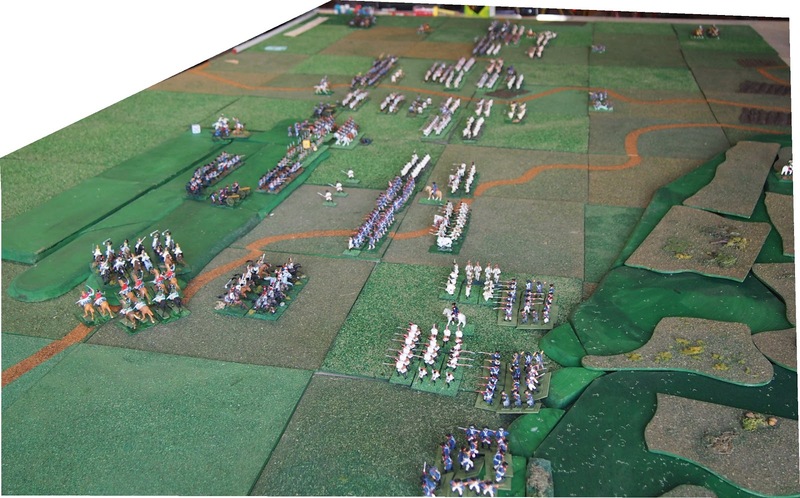 Victor's smaller, more flexible and better trained army is deployed in a narrower line with the infantry divisions in the centre and the mixed divisions of Lasalle and Latour-Maubourg on each flank. 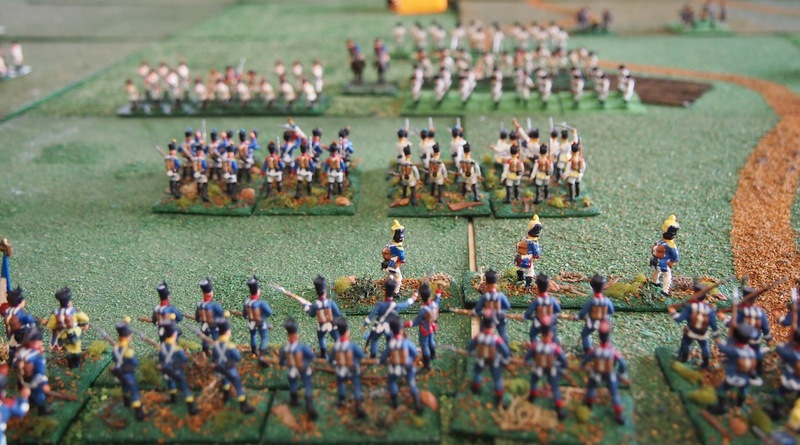 The scale of victory for each side is determined by the number of enemy and friendly divisions ‘broken’. 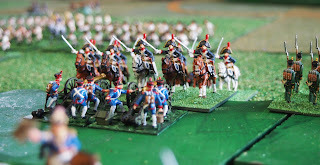 This is a common approach, but has been "stacked" such that the use of Ruffin's division lowers the level of a French victory; sufficient challenge to the chest-puffing pride of any wargamer playing French almost ensuring that the he will not use Ruffin, adding to the balance of the game! The battle began largely per history as the entire Spanish line advanced. 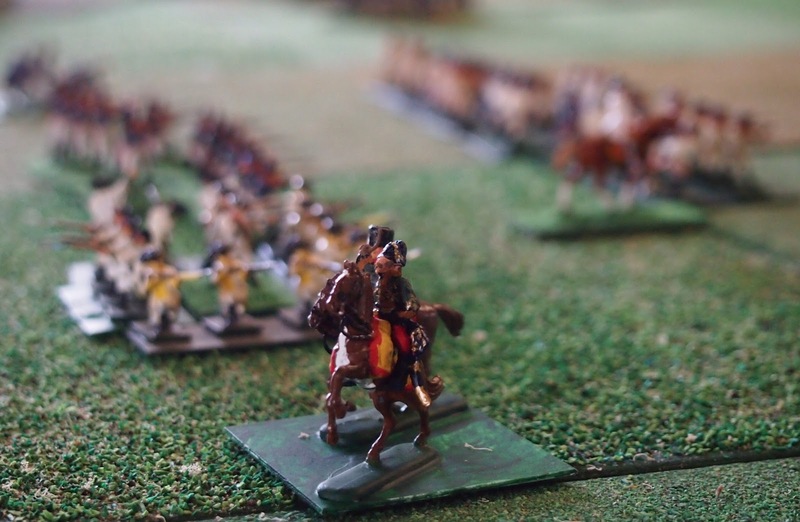 Mark had decided that the best way to achieve victory for the Spanish was to advance and attack all along the line, in the hope of bringing superior numbers to bear at all points and preventing the French from manoeuvring to take advantage of their superiority in cavalry and training. 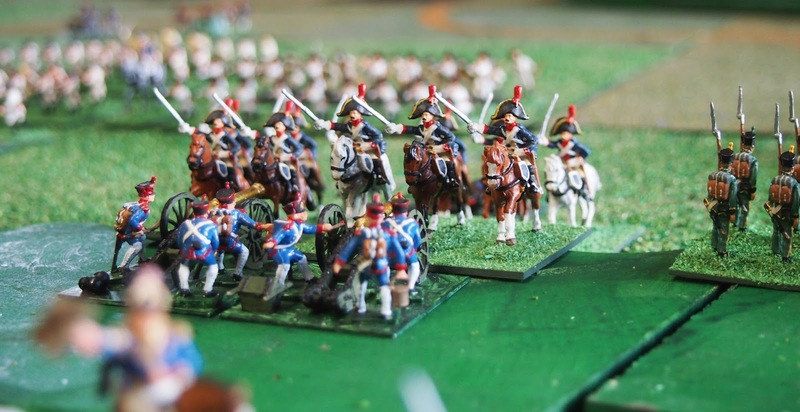 For my part, I intend a ‘left hook’ by Lasalle’s division, joined by a drive at the centre by Vilatte’s (the strongest on the French side) from Turn 3 with Latour-Maubourg holding the right flank, available to exploit opportunities as they arose. 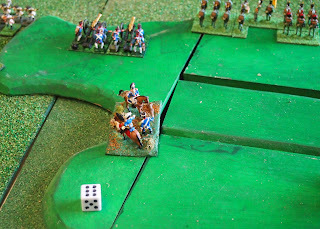 So it was that the Spanish surged forward, but the attack did not go well and, after the first three turns it looked like an early end to the game and to our first wargaming day for sometime. 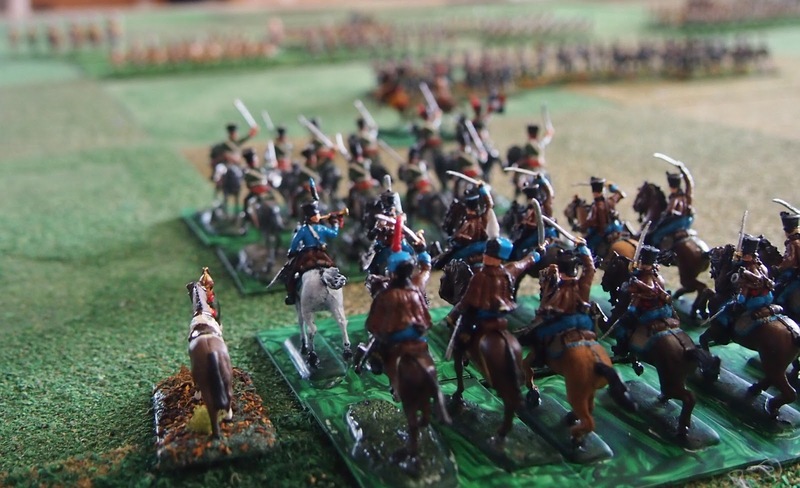 On the Spanish right, the attack was lead by the Duc d’Albuquerque’s cavalry. 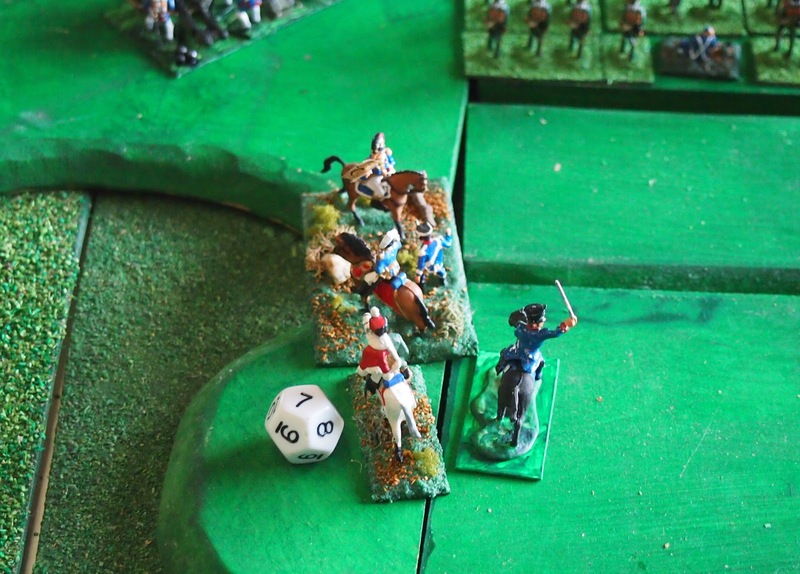 They came into combat with Lasalle’s chasseurs on Turn 2, a mêlée in which they were beaten but not broken. 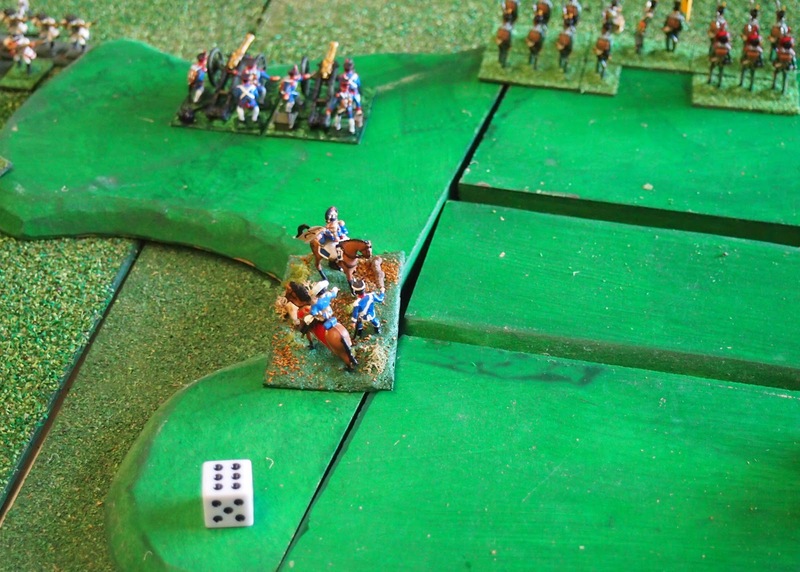 The following turn Spanish units were engaged all along the line, only to lose seven mêlées in a row! The 'disaster' for the Spanish was compounded when Portago’s division ceased to be an effective fighting force (failed divisional morale). 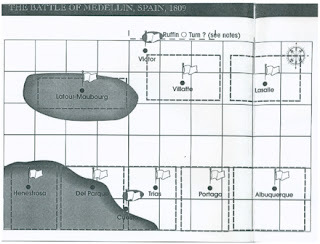 This created a gap in the Spanish line which allowed Vilatte’s division to turn to the right, as ordered, to attack towards Trias, Del Parque and Henestrosa. The remaining Spanish division’s continued to advance, with the exception of Albuquerque’s, and, slowly but surely they achieved some success. 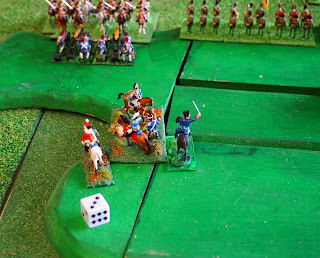 On Turn 6 Trias’ division boldly attacked to stay Vilatte’s drive at the Spanish centre. On the Spanish left, Henestrosa’s division advanced towards Latour-Maubourg, wary of the presence of the latter’s dragoons. 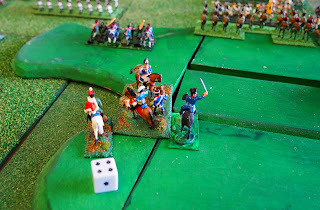 His Granaderos del General and Granaderos Provinciales were ably assisted by Del Parque’s men who attacked Latour-Maubourg’s left. 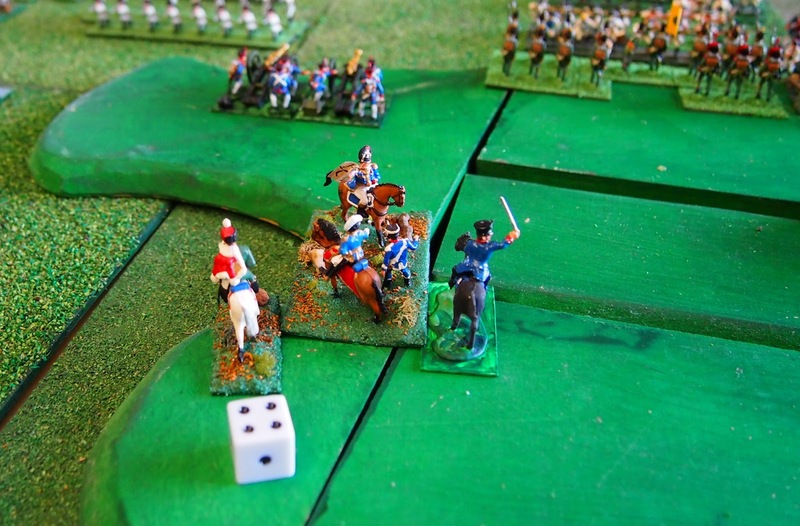 On the Spanish right Albuquerque’s division continued to hold firm against Lasalle’s division. Turn 7. 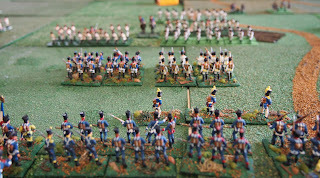 Having beaten Latour-Maubourg’s Hessians (Gross und Erbprinz regiment, heavily disguised as French light infantry) Henestrosa’s and Del Parque’s men drove at the remaining two units of Latour-Maubourg’s infantry on the ridge. 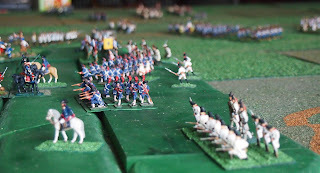 The 1st Nassau battalion (newly painted by Mark) stood firm, but the 2nd battalion, perhaps because they too were heavily disguised as French light infantry, was beaten and retreated. 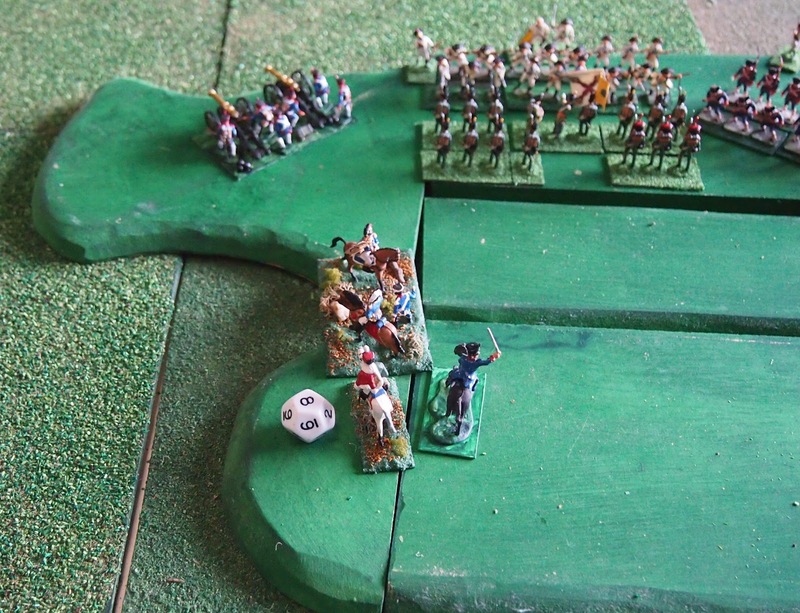 By Turn 8, the 1st Nassau infantry (not suffering at all from "new unit syndrome") continued to hold tenaciously to the ridge against the onslaught of Del Parque’s men. 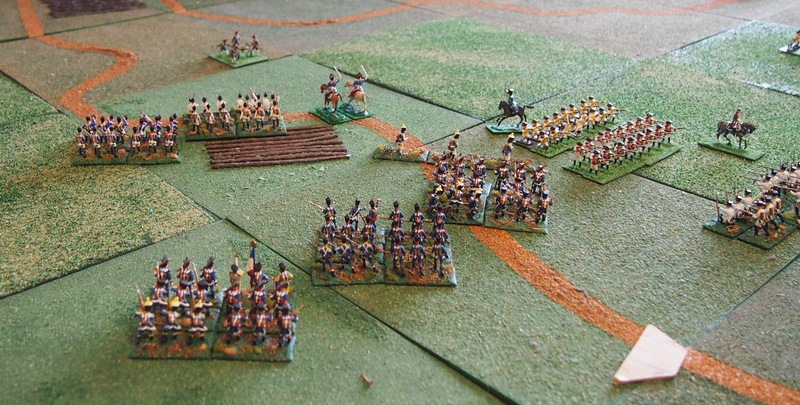 Fortunately for me the 2nd Nassau battalion rallied, as the 20th/26th dragoons, already reduced in numbers, had charged Henestrosa’s Granaderos Provinciales only to fail against the latter’s square and break. Latour-Maubourg’s division was demoralised in the resulting divisional morale test and I was left seriously considering whether to call on Ruffin’s division. 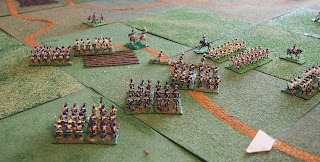 These Spanish successes were offset by the loss of Trias’ division which fell below 1/4 strength and automatically broke. This left Vilatte’s strong division free to drive across the battlefield towards Del Parque’s division. The game concluded on Turn 9. 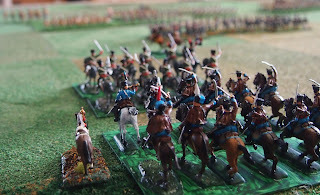 Latour-Maubourg’s 2nd/14th dragoons which had charged and dispatched two of Henestrosa’s second rate infantry regiments Rgt. Lig de la Serena and Rgt. Lig. 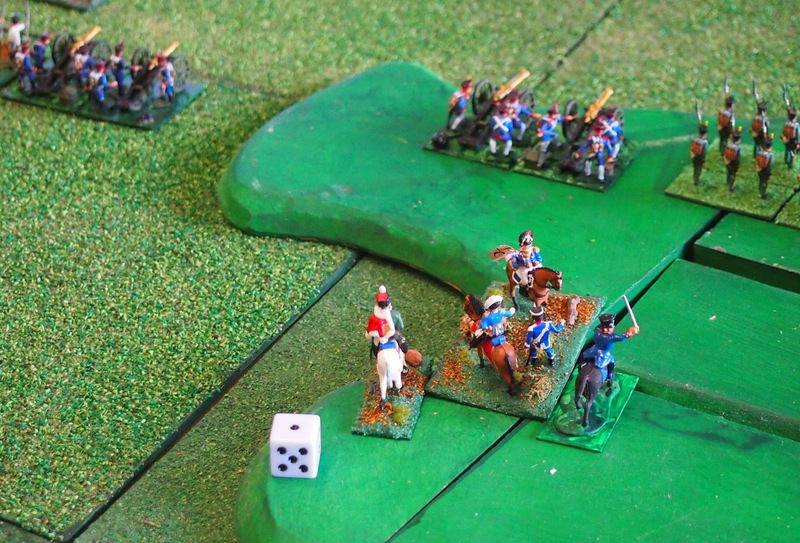 Vols Plasencia in Turn 8, which then fell below half-strength and failed divisional morale. 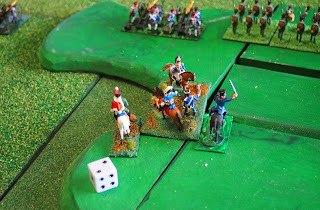 A summary of the result somewhat belies the closeness of the tussle; three Spanish divisions broken, to none on the French side. 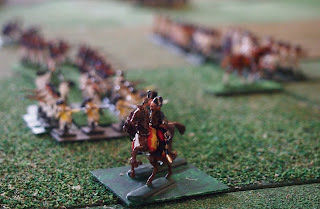 A more detailed look shows how close the Spanish had come and why ‘Victor’ had to consider long and hard about the need to ‘phone a friend’ and call up Ruffin’s reinforcements. 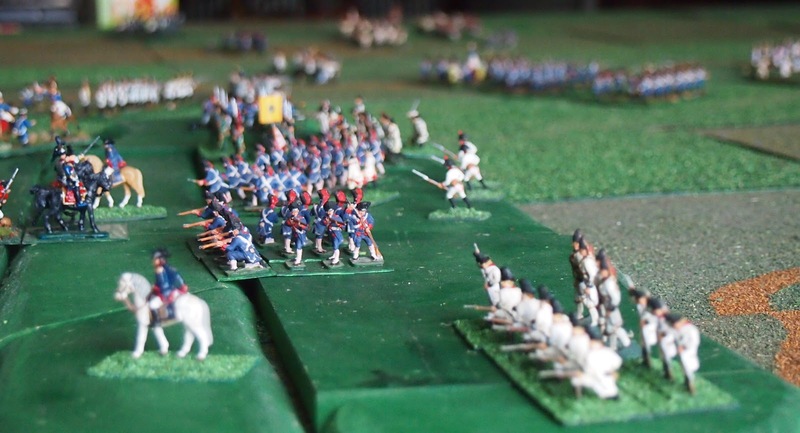 • Of three French divisions, Lasalle’s ended the game at half strength, Latour-Maubourg’s below one-third strength and Vilatte’s division was near full strength. 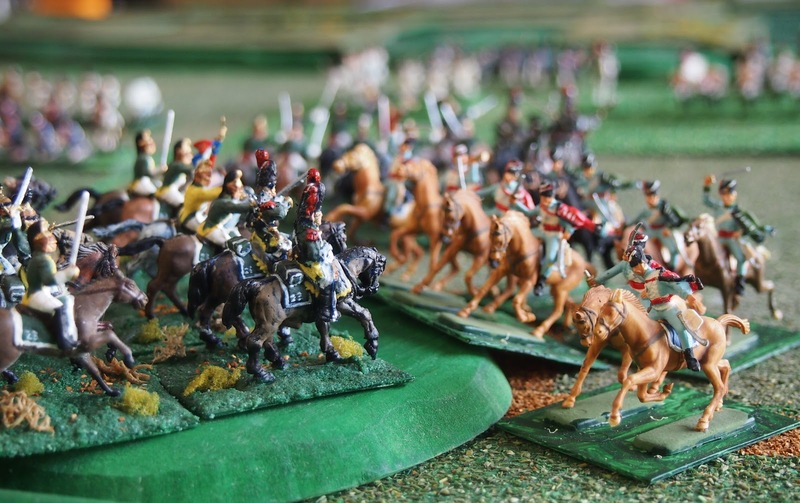 • For the Spanish, Portago’s, Triad’s and Del Parque’s divisions were broken, Albuquerque’s was above half-strength (just) and held firm while and Henestrosa’s was at two-thirds strength. 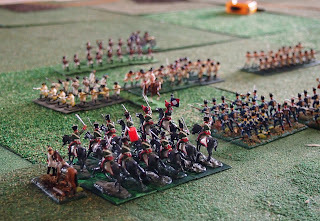 It was a clear French victory, but could so easily have gone the other way. 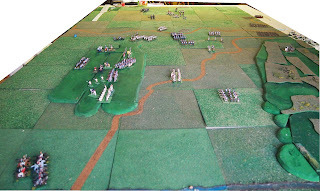 Leach, C and Conliffe, A (1997) Fields of Glory: Historical Scenarios for Corps Sized Napoleonic Battles in Miniature. Quantum Printing, New York, NY. 35 pp. Great looking game James. One day I'll have as many painted figures on my tabletop! Thanks Steve. 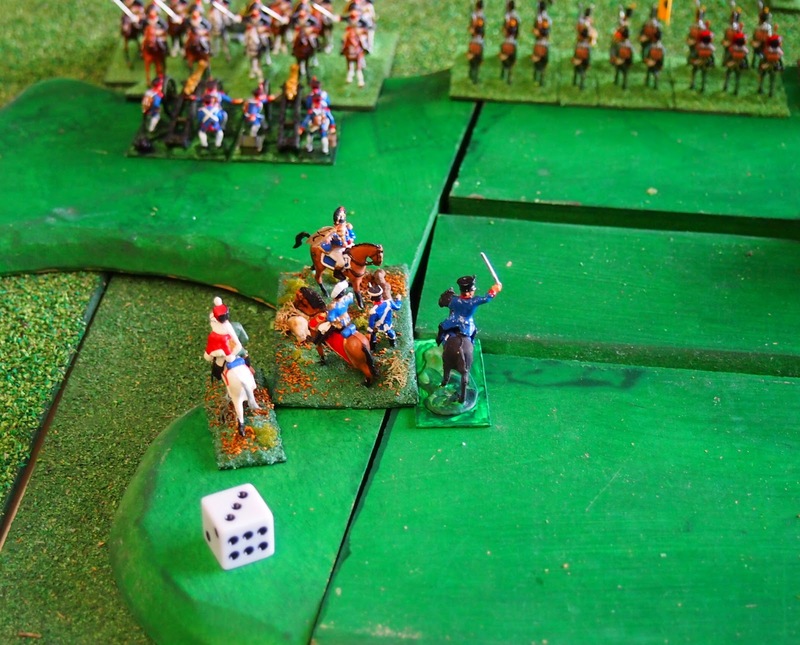 Now you have settled on some rules you can focus on painting and using the figures "in anger'! Seriously, their contribution during the Peninsular War has been downplayed heavily by both Franco- and Anglo-centric writers. After I finish my Prussian expansion this summer, it is on to British and Spanish for me! 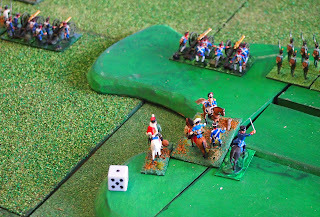 Very nice looking battle, with a great spanish resistance! Thanks Peter, Ben and Phil. You are all gonna love the next game report that I am currently preparing...!